As with many artistic fields, the world of puppetry is seeing a lot of change. Performers are facing new challenges in an increasingly complex marketplace, but there are new opportunities for crossover in the arts as well. 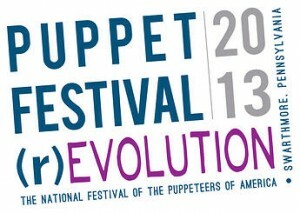 This month, more than 500 puppeteers came from across the U.S. to participate in Puppet Festival (r)Evolution, hosted at Swarthmore College and organized by Robert Smythe, this year’s festival director for The Puppeteers of America. Today, puppets, are finding their way into an increasing number of arts disciplines and Smythe believes this reflects a growing understanding that puppets can play a unique role that goes beyond special effects or standing in for human characters. “People engage differently with puppets, because puppets represent an alternate type of reality, and so require a person to suspend disbelief and be willing to connect with the character differently than we would with one portrayed by a person,” says Smythe. 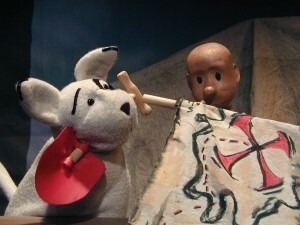 “What you realize once you’ve worked with puppets, is that they broaden the range of possibilities for telling a story. For example, in theater, you normally have to allow time for action to shift – whether that involves making a scenery change, or having characters move in or out of the action. With puppets, you’re working in an alternate reality, so they can say and do things the people can’t, they can appear and disappear instantly, and exist in a fantasy world. “The integration of puppetry with other fields such as theater, music and dance, reflects a larger trend in puppetry, which is that it’s become a much more collaborative art form than it’s traditionally been which I believe is a good thing. In the past, if you wanted to do your art, you’d hire staff you’d teach your methods to, and then you’d focus on having the group create your vision. Now, people in the field are much more specialized, and no one’s expected to do everything. As a result, you gain the benefit of having a group of individuals with specific talents, training and expertise, come together to produce a great performance. Not surprisingly, technology is also a driving factor in change. There are many new things possible and at the same time, new questions are arising about what puppets even are. Some practitioners would prefer to see that answered in the purist, traditional form; but others see a lot of overlap with disciplines like robotics, animatronics, and even with computers, which is why one of the festival workshops was about creating digital puppets. Robert Smythe has been working with puppets for about 45 years. He is the Director of Writing for The Puppet Theater at the Eugene O’Neill Theater Center and the Director of the 2013 National Festival of the Puppeteers of America. He was also founder of Mum Puppettheatre, which ran in Philadelphia for more than twenty years. For more information, visit The Puppeteers of America.